The Road to Home (2015), is an award-winning documentary that tells the story of Benny Wenda, the Nobel Peace Prize nominated West Papuan independence leader, in his ongoing struggle to free his people from Indonesian colonial rule. Since his dramatic escape from an Indonesian prison in 2002, where he was held in isolation and tortured as a political prisoner, Benny has been an unceasing crusader on the international scene, campaigning to bring about an end to the suffering of his people at the hands Indonesia’s brutal colonial regime. Granted political asylum in the UK, Wenda’s freedom of movement was restricted in 2011 when, at the behest of the Indonesian government, Interpol issued a ‘red notice’ putting him at extreme risk of extradition should he travel. The following year the ‘red notice’ was lifted after being deemed “predominantly political in nature”. Wenda then embarked on a world-wide “Freedom Tour” to build support and awareness for the West Papuan Independence Movement. To date Benny has performed and spoken in such diverse places as New Zealand, Australia, Switzerland, Poland, the United Kingdom, Papua New Guinea, the Solomon Islands, the United States of America, and many others. British filmmaker / activist Dominic Brown of Dancing Turtle was given exclusive access, over a two year period, to follow the Nobel Peace Prize nominated freedom fighter and document his inspirational journey to gain independence for his people. Available to watch on DVD. Best Documentary Feature at the Amsterdam Film Festival 2016, Van Gogh Awards. 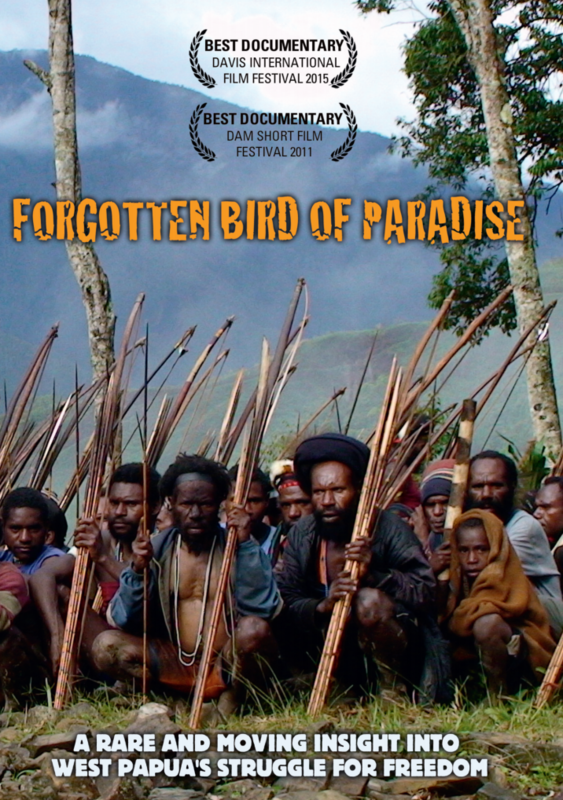 Click on the image below to watch Forgotten Bird of Paradise, an undercover documentary about West Papua's struggle for freedom.